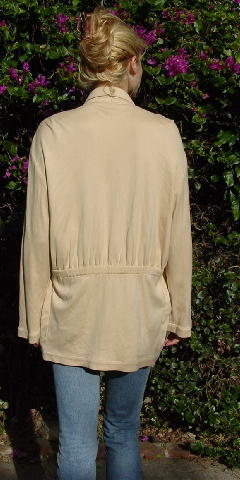 This creamy tan vintage jacket is 100% cotton and was made in Hong Kong. It has a loose elastic waistband with a one button front waist closure. There are two deep front pockets. If fits more like a size Small if buttoned (the lower portion especially), and like a size Medium if unbuttoned. 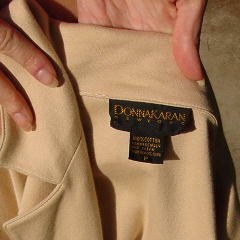 It was used in a magazine photo shoot with Donna Karan cream linen pants, no top, and a Harry Winston diamond necklace. side to side at bottom hem 17 1/2"